Member of Council of State. Dutch jurist; born at Amsterdam April 28, 1838. His father was Carel Daniel Asser (1813-85). His mother was a sister of Godefroi, Dutch minister of Justice. 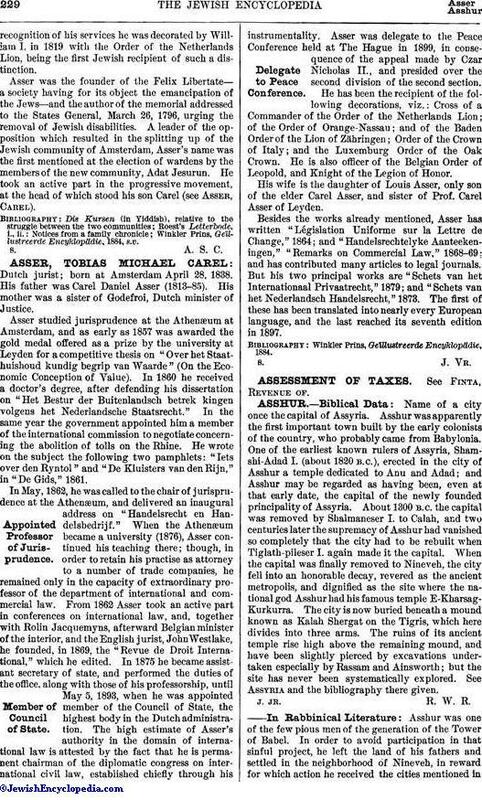 Asser studied jurisprudence at the Athenæum at Amsterdam, and as early as 1857 was awarded the gold medal offered as a prize by the university at Leyden for a competitive thesis on "Over het Staathuishoud kundig begrip van Waarde" (On the Economic Conception of Value). In 1860 he received a doctor's degree, after defending his dissertation on "Het Bestur der Buitenlandsch betrek kingen volgens het Nederlandsche Staatsrecht." In the same year the government appointed him a member of the international commission to negotiate concerning the abolition of tolls on the Rhine. He wrote on the subject the following two pamphlets: "Iets over den Ryntol" and "De Kluisters van den Rijn," in "De Gids," 1861. In May, 1862, he was called to the chair of jurisprudence at the Athenæum, and delivered an inaugural address on "Handelsrecht en Handelsbedrijf." When the Athenæum became a university (1876), Asser continued his teaching there; though, in order to retain his practise as attorney to a number of trade companies, he remained only in the capacity of extraordinary professor of the department of international and commercial law. From 1862 Asser took an active part in conferences on international law, and, together with Rolin Jacquemyns, afterward Belgian minister of the interior, and the English jurist, John Westlake, he founded, in 1869, the "Revue de Droit International," which he edited. In 1875 he became assistant secretary of state, and performed the duties of the office, along with those of his professorship, until May 5, 1893, when he was appointed member of the Council of State, the highest body in the Dutch administration. The high estimate of Asser's authority in the domain of international law is attested by the fact that he is permanent chairman of the diplomatic congress on international civil law, established chiefly through his instrumentality. Asser was delegate to the Peace Conference held at The Hague in 1899, in consequence of the appeal made by Czar Nicholas II., and presided over the second division of the second section. He has been the recipient of the following decorations, viz. : Cross of a Commander of the Order of the Netherlands Lion; of the Order of Orange-Nassau; and of the Baden Order of the Lion of Zähringen; Order of the Crown of Italy; and the Luxemburg Order of the Oak Crown. He is also officer of the Belgian Order of Leopold, and Knight of the Legion of Honor. His wife is the daughter of Louis Asser, only son of the elder Carel Asser, and sister of Prof. Carel Asser of Leyden. Besides the works already mentioned, Asser has written "Législation Uniforme sur la Lettre de Change," 1864; and "Handelsrechtelyke Aanteekeningen," "Remarks on Commercial Law," 1868-69; and has contributed many articles to legal journals. But his two principal works are "Schets van het Internationaal Privaatrecht," 1879; and "Schets van het Nederlandsch Handelsrecht," 1873. The first of these has been translated into nearly every European language, and the last reached its seventh edition in 1897. Winkler Prins, Geϊllustreerde Encyklopädie, 1884.